One fall weekend in 2008 my wife, Karen, and I were visiting her parents at their home on Long Island. 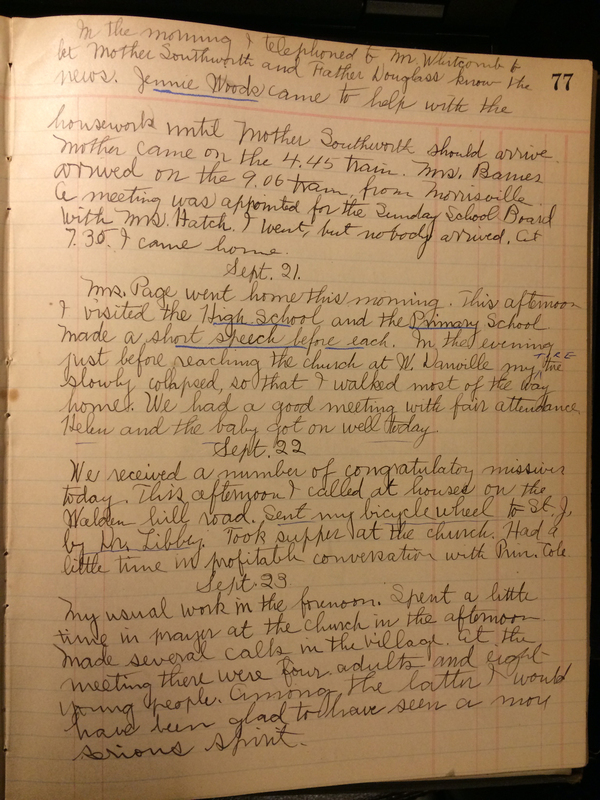 After dinner one evening, my mother-in-law asked if I might like to see a collection of journals kept by her maternal grandfather, Glenn Welmer Douglass (1884–1968), a Methodist minister from New England. Up from the basement came a box and a bag containing a dozen or more books of various shapes and sizes, each volume marked on the cover or spine with a single year. The earliest volume was from 1909, the latest from 1966. 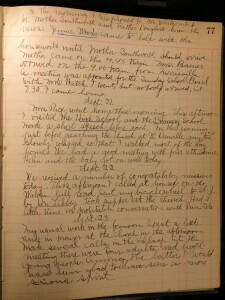 My mother-in-law said her grandfather had kept a daily journal from about the age of twenty until his death. Her brother had the rest of the collection. 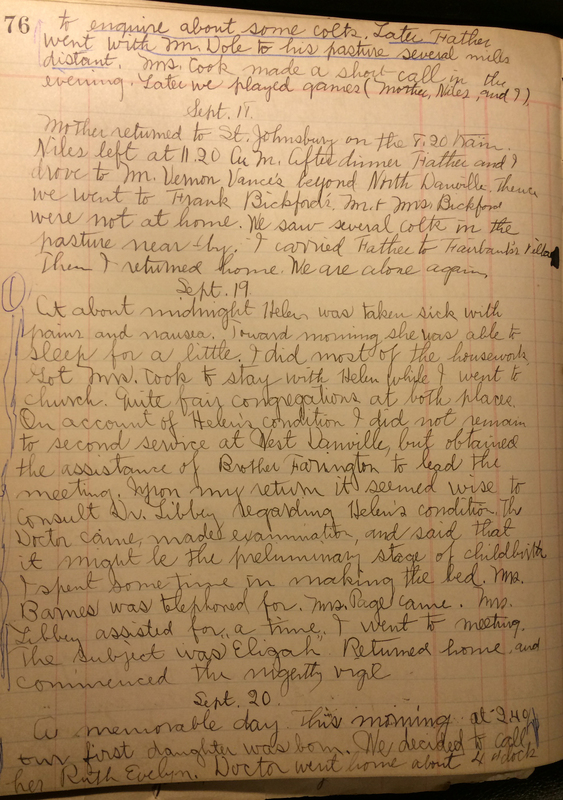 I thumbed through the journals; almost every entry contained meticulous detail: “arose 6:05; dressed 6:08…” I knew from prior research that for a period of time in the early 1900s, Glenn and his wife, Helen Evelyn Southworth (1880–1960), lived in Danville, Vermont, a mid-sized town of about 1,500 people in Caledonia County. A number of my own ancestors and relatives were born or lived in Caledonia County throughout the late nineteenth and early twentieth centuries. Danville in particular is an interest of mine as that is where many of my Woods ancestors and relatives are buried, in Danville Green Cemetery. 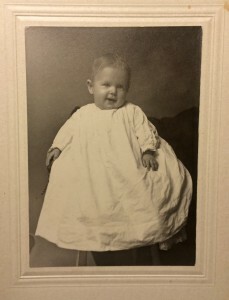 While I had wondered before if any of my ancestors or relatives might have known my wife’s ancestors during the period they lived in Danville, I hadn’t seriously pursued the question. With the treasure trove of information before me, I thought I might start, but without any of my genealogical notes at hand, the only relatives I knew for sure lived in Danville during the same period as the Douglass family were my great-great-uncle Seth Woods (1863–1926) and his wife Jennie (Hatch) Woods (1877–1951). A memorable day this morning at 2:40 our first daughter was born. We decided to call her Ruth Evelyn. Doctor went home about 4 o’clock. 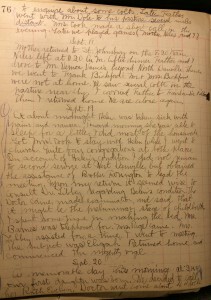 In the morning I telephoned to Mr. Whitcomb to let Mother Southworth and Father Douglass know the news. Jennie Woods came to help with the housework until Mother Southworth should arrive. Mother came on the 4:45 train. Mrs. Barnes arrived on the 9:00 train from Morrisville. A meeting was appointed for the Sunday School Board with Mrs. Hatch. I went, but nobody arrived. At 7:30 I came home. What a serendipitous entry! I could hardly believe it. My wife and I first met in Boston about 2001; I was born in Texas and raised in Northwestern Vermont along Lake Champlain, and she was born and raised on Long Island. Before we married, Karen had never been to Vermont and here I was reading how, 92 years before we met, a member of my family was present the day my wife’s grandmother was born! Such is the wonder and enjoyment of family history. That is a wonderful story! Discoveries like that propel me forward in genealogical research. Difficulties like dead ends, cranky microfilm readers, burned church records, etc. shrink in the face of such a great find. Thanks for posting it. That was a wonderful story. Thank you for sharing! I agree with Kathy McHale! And a Thanks from me too! 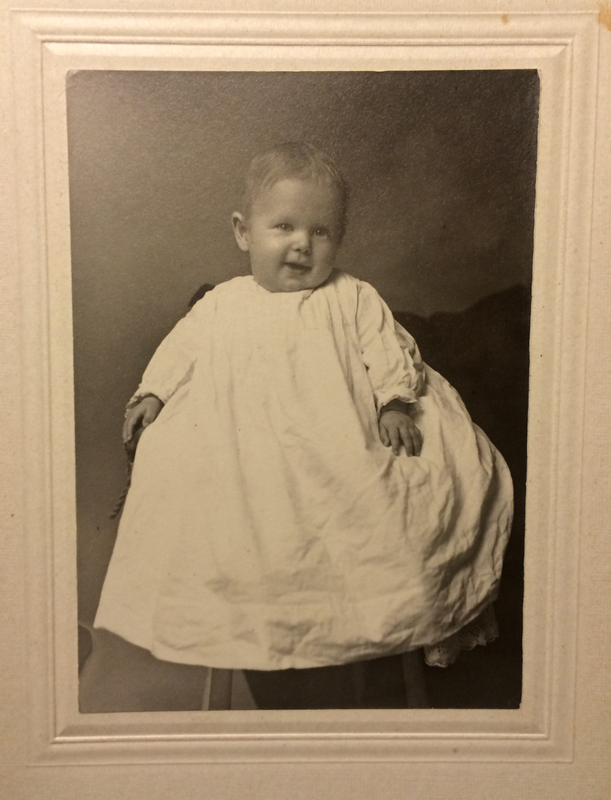 Dear Ryan~~~And people think that genealogy is a dry subject? I love the story~~~and even more, love the fact that you shared this gem with us. Made my entire afternoon. At a dance, a girl from my high school recognized me (we didn’t know each other) introduced me to her date, saying he was also born in Evanston but had grown up in Virginia… at the next one, he was alone and asked me out…a month later he came to dinner…when my mom heard his mom’s birth name she gasped and dashed for a photo album… her 9th birthday picture showed his aunt and his mother! 42 years later we’re still married, thanks to a chance encounter at a dance at Great Lakes Navy Base in 1969. I have that old photo, too. Fantastic story!!! If only people would care about the past and where they came from.Im sure if everyone started their Family Tree they would get hooked on one of the branches.